Thanks to Tom Reynolds, who shot this beautiful photograph of a Red-Banded Egret in flight, following its release at Laguna de Santa Rosa in Sonoma County. 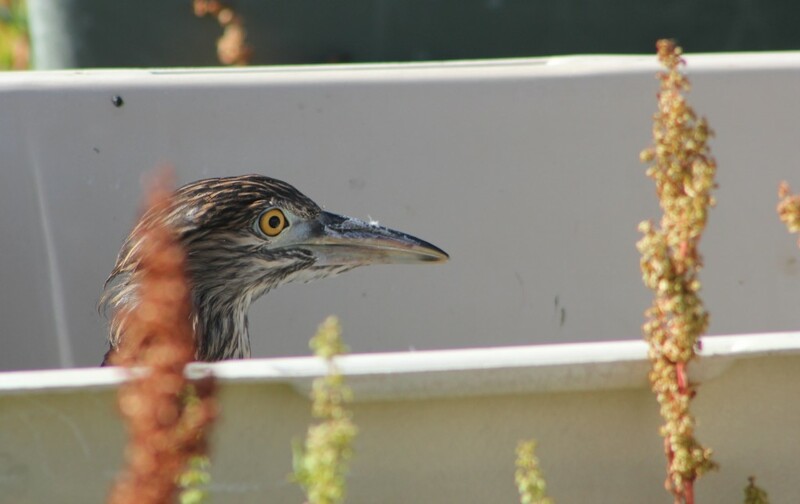 A total of five egrets, seven Black-crowned Night Herons and one Great Blue Heron were released this past Thursday. What’s a Red-Banded Egret? Find out more about this International Bird Rescue program here. 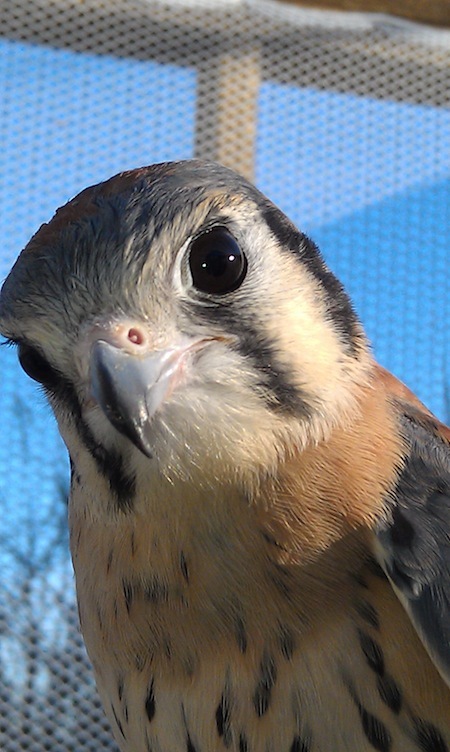 One of our favorite bird stories this month is of an American Kestrel named Kele, shown above fulfilling his “foster dad” duties with a baby kestrel at WildCare in San Rafael. Two years ago, Kele originally came to International Bird Rescue’s San Francisco Bay center via members of the public who had noticed that this bird was quite fearless around humans. Clinic staff kept the bird for several months, rehabilitation technician Isabel Luevano reports, as they wanted to be absolutely sure that this bird would be a good candidate as an educational bird rather then a wild bird. Once this determination was made, Wildcare offered to work with the kestrel, where he is now a wonderful educational animal/surrogate father for orphaned kestrels. 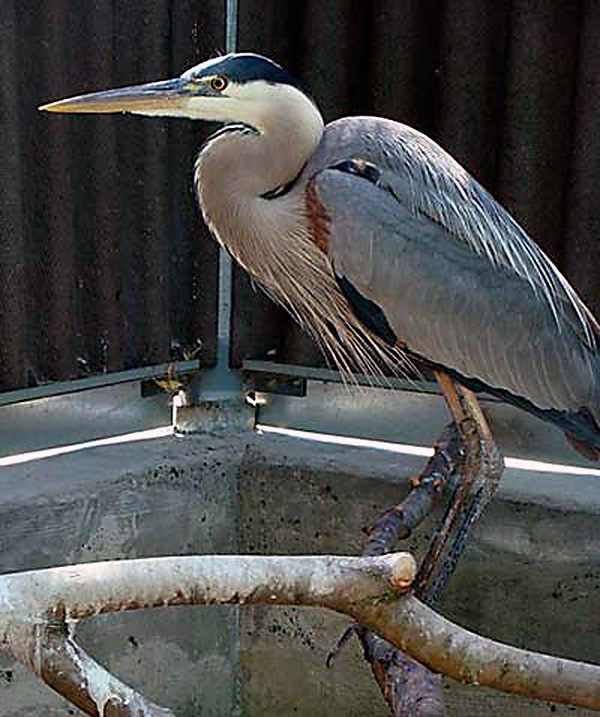 This week, both of our California centers have cared for several Great Blue Herons, the largest and most majestic of the heron species we see at International Bird Rescue. 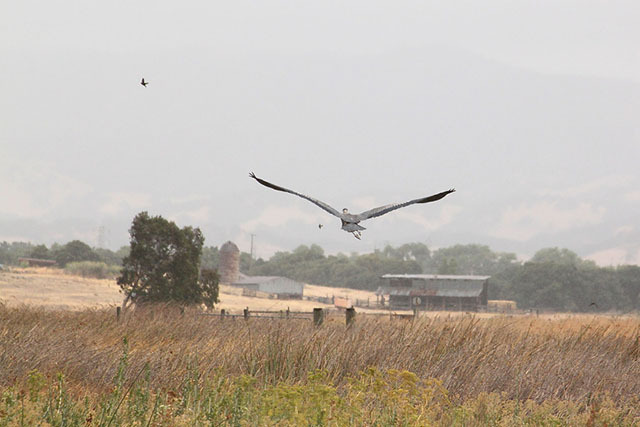 The heron you see above is one of our more recent patients and was successfully released just a few days ago at Suisun Marsh, not far from our San Francisco Bay center. 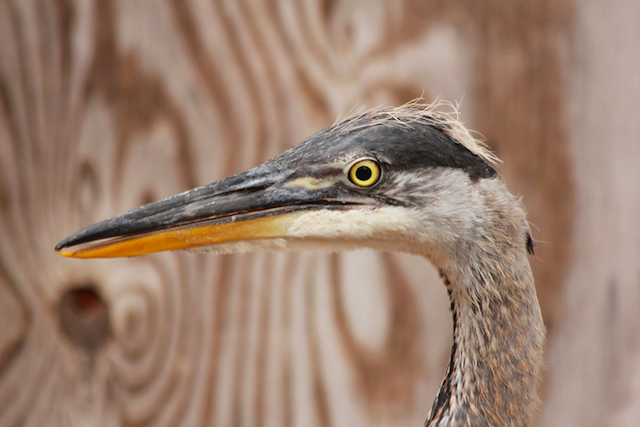 In rehabilitation, Great Blue Herons are easily stressed and dangerous to handle. Their powerful beaks can literally kill a human, and their bones are fragile in a captive environment, where these birds might crash into a wall or branch if spooked. Nevertheless, Great Blue Herons are a privilege to care for, and we want to share a story of one of these amazing birds that came to us twice with a similar problem. On July 23, 1996, a Great Blue Heron, tangled in fishing line with fishing hooks embedded in its wing, was captured and brought to the Lindsay Wildlife Museum in Walnut Creek, Calif. 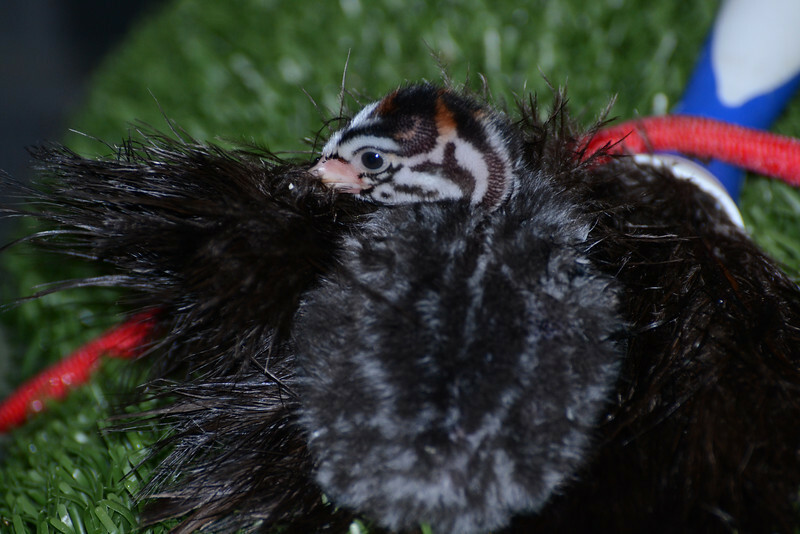 The young hatching bird was stabilized and treated for puncture wounds from hooks, and abrasions from line entanglement. 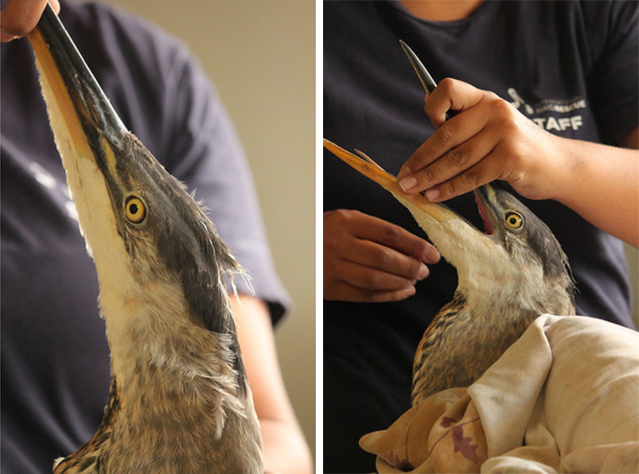 The following day, this heron was brought to International Bird Rescue’s old aquatic bird rehabilitation facility in Berkeley. The bird was put on a regimen of antibiotics and treated for its wounds. Its recovery was quick: On July 29, the bird was banded with a small metal federal leg band (#0977-04747) and released in the Suisun Marsh. Twelve years later, on May 28, 2008, the same Great Blue Heron, now an adult but still wearing band number #0977-04747, was again found entangled in fishing line and fish hooks and was captured at a marina in Oakley, Calif. The bird was brought to Lindsay Wildlife Museum, which again did an excellent job of stabilizing it and removing the fish hooks and line that were tangled around the heron’s wing and leg. This heron was then transferred to International Bird Rescue’s new facility in Fairfield, Calif. As before, it was treated for its wounds, held for a week or so, and on June 5, 2008, the bird was released healthy and strong back into the Suisun Marsh. California has a number of prestigious wildlife rehabilitation organizations open 365 days a year to provide shelter and state-of-the-art care for sick and injured native wildlife. Lindsay Wildlife Museum and International Bird Rescue are two of those organizations and are both leaders in the unique field of wildlife rehabilitation. We have worked in tandem for years to provide the best care for local wildlife. While International Bird Rescue specializes in aquatic bird rehabilitation, Lindsay Wildlife Museum specializes in many other species of native wildlife, including raptors, passerines, terrestrial mammals and reptiles. When we receive an owl or the occasional mammal for care, our team sends these animals to Lindsay for rehabilitation. In turn, they send us the aquatic birds that can benefit from our program and specialized facility. Together, we have helped hundreds of animals by cooperating with each other and putting the needs of the animals first. Great Blue Heron #0977-04747 is a testament to this important relationship and the dedication of these two organizations. The Release Files: a tern and a heron fly again! At last count, our wildlife centers are caring for well over 200 birds, from Pied-billed Grebes to a young American Avocet now learning to master catching live feeder fish. Here are two beautiful releases our staff and volunteers photographed earlier this week. According to Audubon, Elegant Terns were historically only seasonal visitors to California until they were first discovered to be nesting on the West Coast of the U.S. in 1959 (on the beaches of San Diego, to be exact). 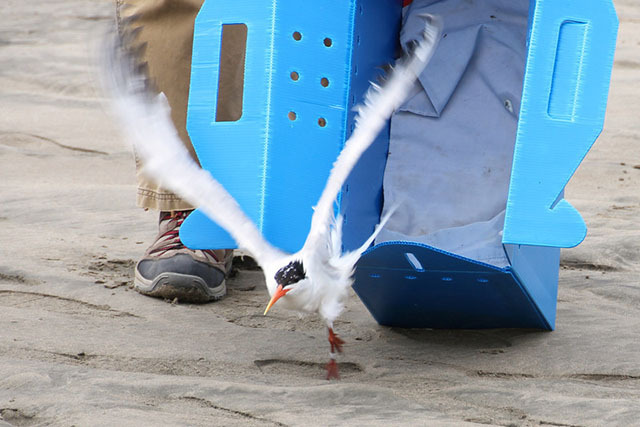 Readers of this blog may remember a tragic event a few years back involving nesting Elegant and Caspian Terns that were hosed off a barge not far from our Los Angeles center in the San Pedro neighborhood. 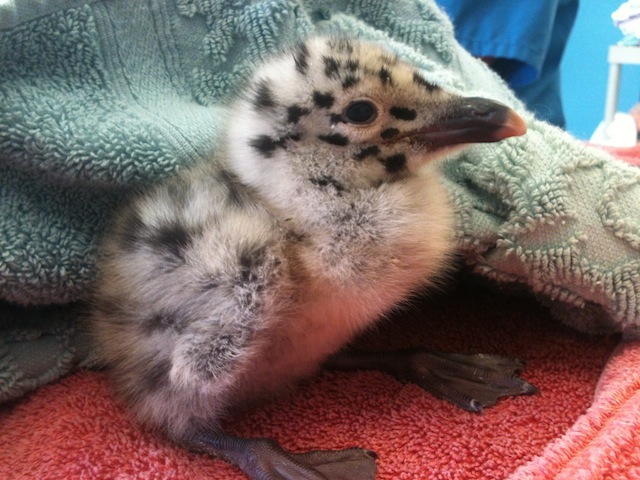 Young birds that survived the incident were cared for by our team. 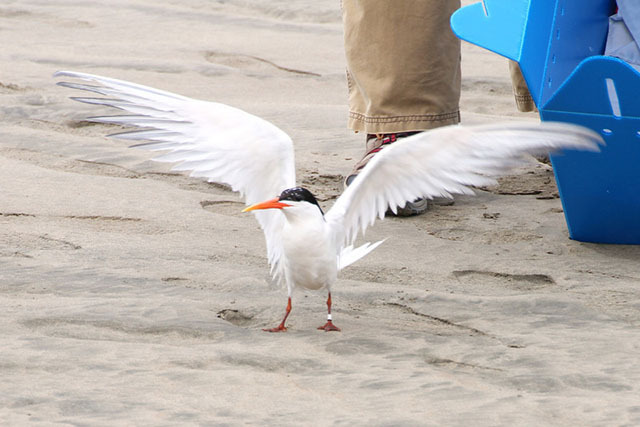 This Elegant Tern was found unable to fly by a member of the public at the Port of Los Angeles’ Pier 400. Upon its June 14 intake, the bird was emaciated and very dehydrated, and had feces covering its feathers. Staff rehabilitation technician and volunteer coordinator Neil Uelman reports that the bird underwent a wash to remove the contamination in addition to much-needed fluid therapy and plenty of food. Here, volunteer photographer Bill Steinkamp photographs the tern’s release. Up north at our San Francisco Bay center in Fairfield, this majestic Great Blue Heron shown below returned to the wild at Suisun Marsh. Last week, the bird was picked up by animal control officers at a Concord office, where it was found in a courtyard slamming against windows. 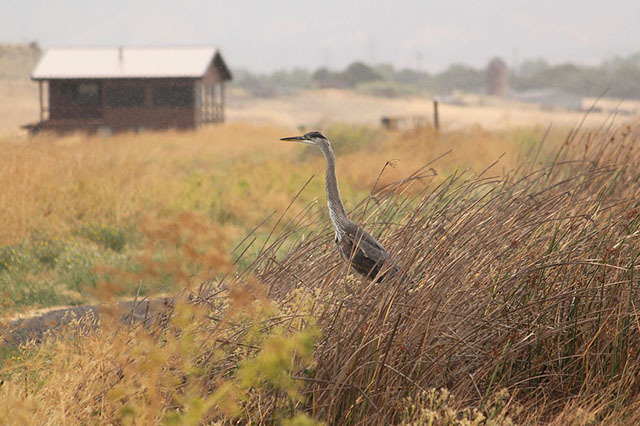 The heron was easily captured and later released at Suisun, the largest brackish marsh on the West Coast. Volunteer coordinator Cheryl Reynolds took these photos of the heron upon release. Bird by bird, our wildlife rehabilitation professionals care for animals in need, 365 days a year. Join us today and be a part of our “Every Bird Matters” team. The Ruddy Duck you see in the background of the photo above was brought to California Wildlife Center in Malibu late last month with a laceration on the right ventral wing. A few days after its wound was cleaned and sutured, the bird was transferred to International Bird Rescue’s Los Angeles center to receive continued medical treatment and antibiotics for the injury, which had completely healed by June 19. 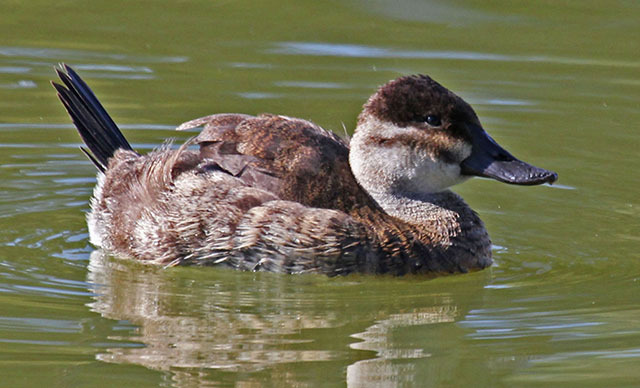 The duck also went through the waterproofing process while in care — crucial for any bird that inhabits marshes, as Ruddy Ducks do. 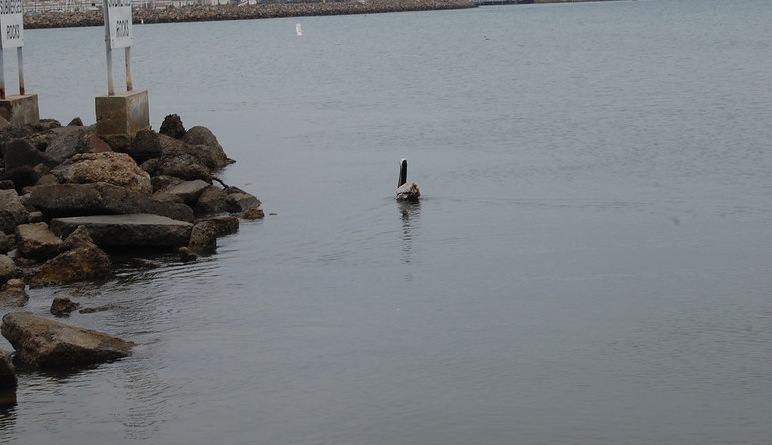 Here, the duck is released at Ballona Wetlands, one of the few remaining wetlands in the Los Angeles basin and a key stopover point for migratory birds. Christopher Taylor, one of our past Photographers in Focus honorees, has photographed an array of species that call Ballona Wetlands home (or at least a rest stop en route elsewhere in the world). 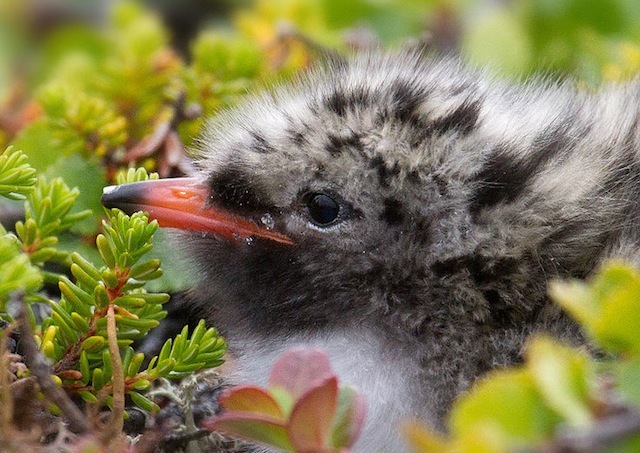 — Biologists at a wildlife refuge in Maine see a 40% decline in Arctic Terns over the past decade as their chicks starve due to a lack of herring. 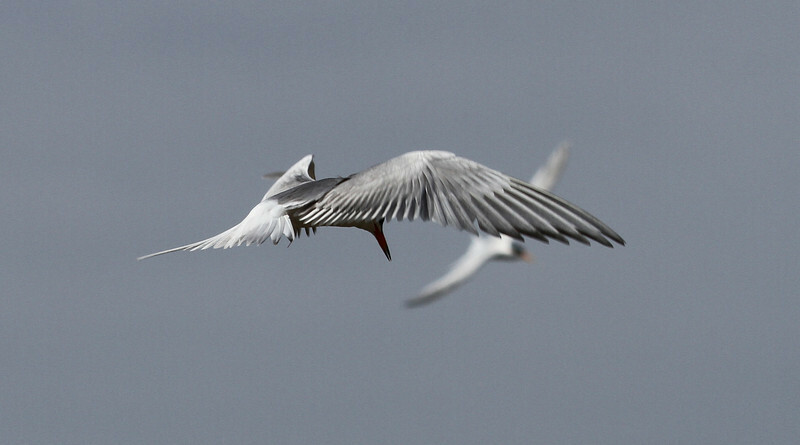 Researchers are unsure whether herring, a primary food source for terns, have traveled elsewhere or have gone deeper for colder water (Arctic Terns cannot dive deep for fish). Arctic terns arrive at the Maine islands after a month of flying from the Antarctic, about 470 miles a day — 14,000 total — low on energy, longing for a bite. If they lack food and energy, “they can’t keep the gulls off them,” Welch said. Gulls eat terns. In the past two years, Welch said, biologists at the refuge went to the most productive foraging grounds where seabirds, whales and dolphin prey on herring, and spotted fishing trawlers. — Sonoma Land Trust has secured a $5 million grant from the California Wildlife Conservation Board to restore a San Pablo Bay tidal marsh at Sears Point Beach. 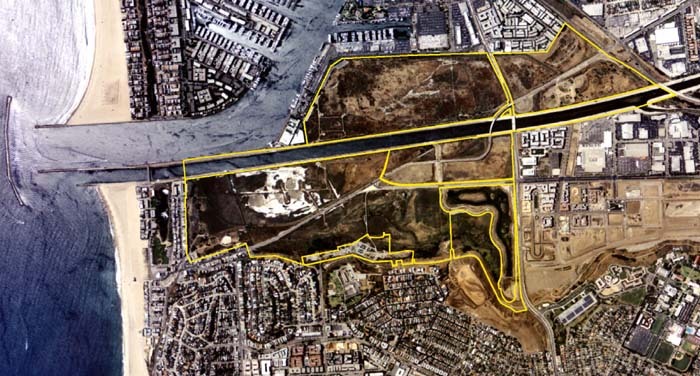 “The Sears Point project, one of the largest tidal wetlands restoration projects in the state, includes restoration of a nearly 1,000-acre coastal wetland ecosystem and enhancement of more than 1,350 acres of seasonal wetlands and uplands grasslands,” the organization announced. 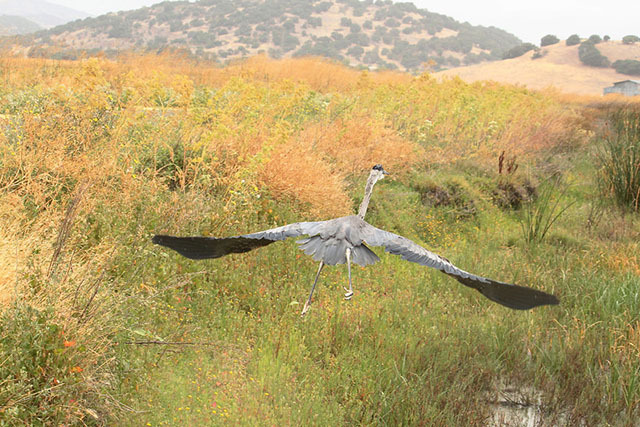 Great Blue Heron at IBR’s Los Angeles center, photo by Paul Berry. Pied-billed Grebe chick with feather duster surrogate at the San Francisco Bay center, photo by Isabel Luevano. 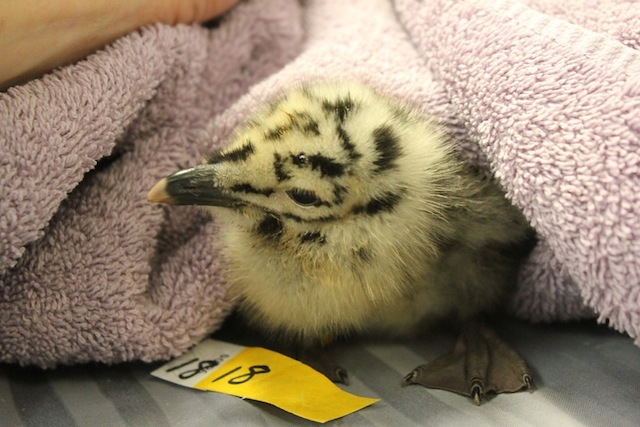 Canada goslings, Mallard ducklings and Western Gull chicks (shown above) are among many common orphaned birds cared for each year at our centers. Whenever possible, we introduce a surrogate parent so that baby birds imprint on their own species — a critical aspect of bird development. We currently have two such surrogates at our L.A. wildlife care center. 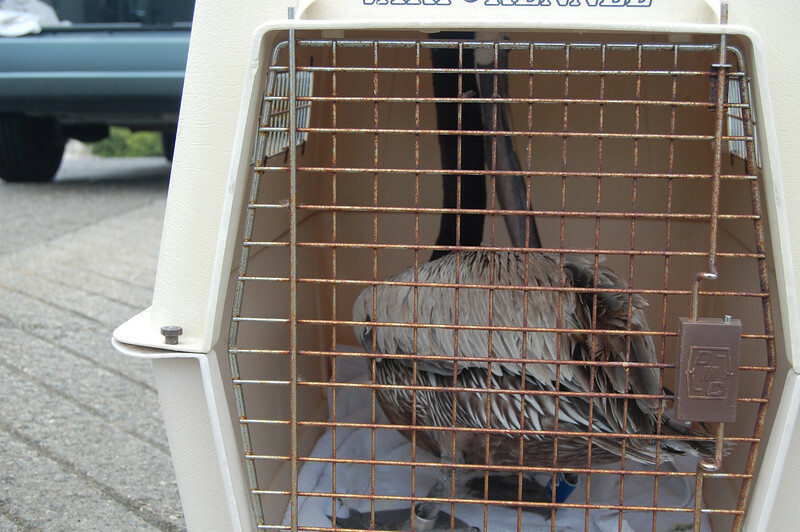 One is this Canada Goose (above), transferred from a partner wildlife rehab organization in the Los Angeles region. L.A. center staffer Neil Uelman reports that this bird had been found in a medical office parking lot in Agoura Hills with a suspected head injury, and an exam by our avian veterinarian confirmed a fractured jaw. The goose began physical therapy earlier this month, and the jaw appears to be steadily improving. 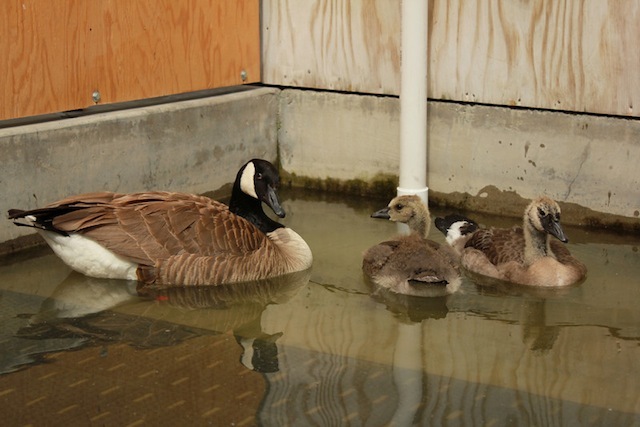 During its time at our center, the goose has taken on the task of surrogate parenting for three goslings, two of which are shown in the photo above. “At first the bird was hesitant to be a parent, and then slowly accepted the fact,” Uelman says. 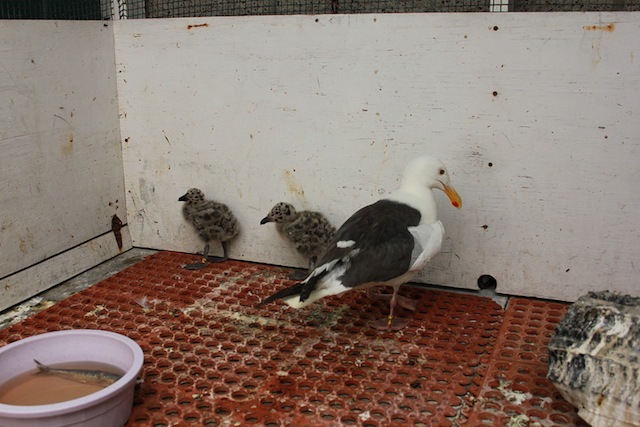 Likewise, this Western Gull has taken over surrogate parenting duties for Western Gull chicks in our care. The adult bird was found at Paradise Cove in Malibu with a severe wing droop as well as skin sloughing from blisters on its left foot. In addition to a regimen of antibiotics and pain medications, we administered a wing wrap which quickly improved the droop. Further treatment to the wing is ongoing, and the bird is recovering in a large outside cage. Below, baby Western Gulls feed at the center. The Dawn Saves Wildlife campaign is here! This year, we’re thrilled to be a part of the Dawn Saves Wildlife campaign, filmed in part at our Los Angeles wildlife care center and starring our amazing rehabilitation staff, as well as our friends at The Marine Mammal Center. Check out the first ad here, and be on the look out for more animal stories throughout the summer, featuring our own wildlife rehabilitation heroes. How can you get involved? Subscribe to the Dawn Saves Wildlife YouTube page and share this video! And check back often on Dawn’s Facebook page as well! There’s plenty in store this summer. 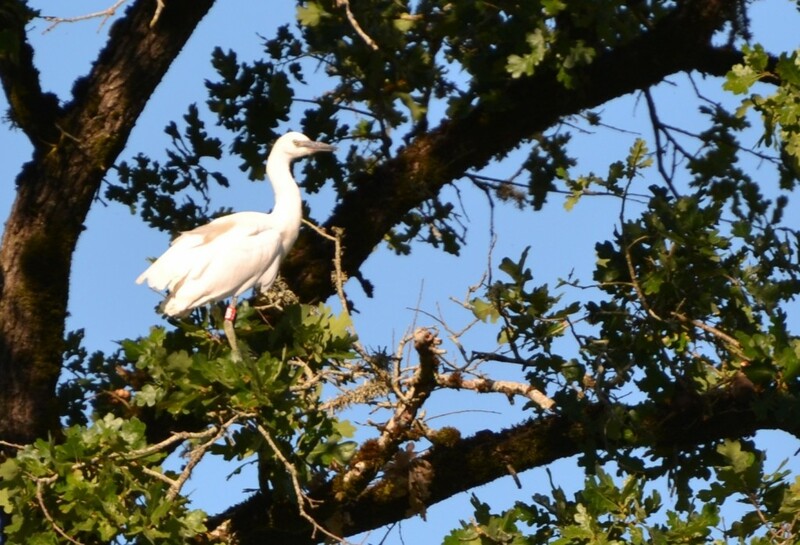 Thanks to everyone who attended Thursday’s heron and egret release at Laguna de Santa Rosa! Here’s some great shots of the release from three different lenses. For Isabel Luevano, rehabilitating lost and injured baby birds is a small way of making up for the effects humans have on the earth. “Even though people do so much harm to nature and wildlife and the ecosystem in general, it’s a really good feeling to know you’re helping a part of it, doing better things rather than worse things,” said Luevano, a rehabilitation technician for International Bird Rescue, after releasing a flock of juvenile birds into the wild at the Laguna de Santa Rosa on Wednesday. Special thanks to the Sonoma County Fish & Wildlife Commission for supporting these birds through a generous $5,000 grant that helps cover the cost of their rehabilitative care. We couldn’t do it without them! 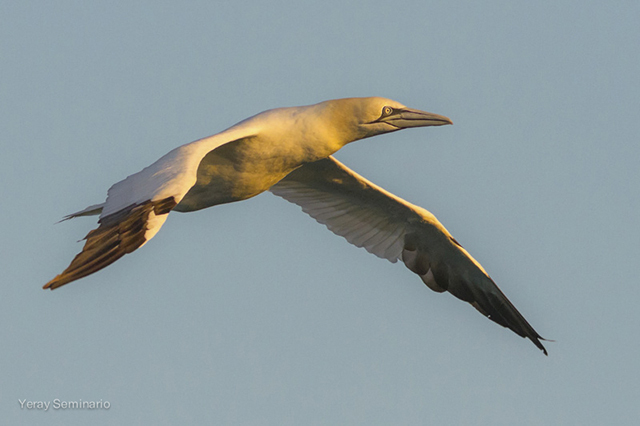 The news this week that an estimated 400,000 seabirds die in gill nets annually underscores just how much of a problem fishing methods can be for the planet’s aquatic birds. Beyond the headlines, we see injuries resulting from hooks, lures and monofilament every day at our wildlife care centers. That’s why International Bird Rescue has heartily supported initiatives to reduce fishing gear in the environment. 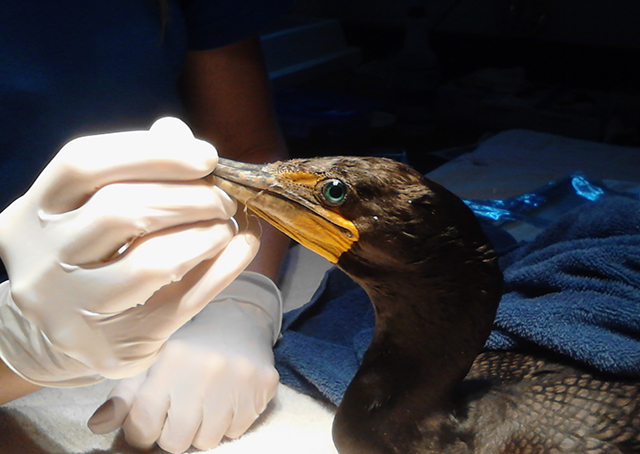 Among the birds in care this week at our Los Angeles wildlife center was this Double-crested Cormorant (Phalacrocorax auritus), recently brought to us from El Dorado Nature Center, where it appeared lethargic, emaciated and not so wary of humans, as it naturally should be. The cormorant’s temperature was below normal upon intake. 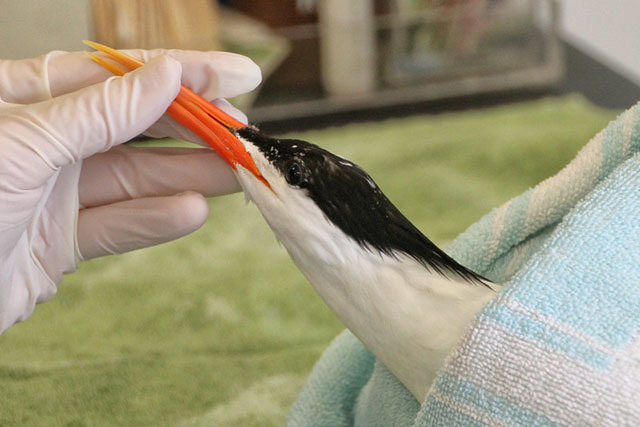 After a supplemental tubing, staff checked on the bird minutes later and noticed this animal had regurgitated its food — as well as a small amount of monofilament fishing line, which dangled from the side of its mouth. Our staff did some further investigation of the esophagus region and located a hook that was stuck about halfway down the cormorant’s throat. The team succeeded in extracting the fish hook. But sadly this bird did not ultimately survive, mostly likely having starved from not being able to eat due to the fish hook and line, notes IBR director Jay Holcomb. We can all help to reduce the amount of waste in our oceans and waterways. Find out how you can get involved at California Lost Fishing Gear Recovery Project and Coastal Clean-Up Day on September 21. — Critically endangered species such as the Waved Albatross are among the estimated 400,000 seabirds killed every year by gill nets — and the number of victims could be much higher, researchers note in the journal Biological Conservation. While the mesh used in such nets is designed to ensnare fish by their gills, the technique used by local fisherman and commercial vessels alike can catch other animals too large to swim through, including sea turtles and marine mammals. Nearly half of the seabirds killed by gill nets were in a section of ocean stretching from the northern tip of Africa to north of Greenland and Scandinavia. The bird catch was said to be especially high around Iceland, a prolific seabird habitat, where researchers estimated that 100,000 birds die every year. — In their attempts to navigate through thick fog, migrating American Redstart, Magnolia and Palm Warblers landed on a Wisconsin Department of Natural Resources research vessel 16 miles out in Lake Michigan. Thank you to IBR volunteer Margee Scannell for taking this memorable photo! Are you following us on Twitter? 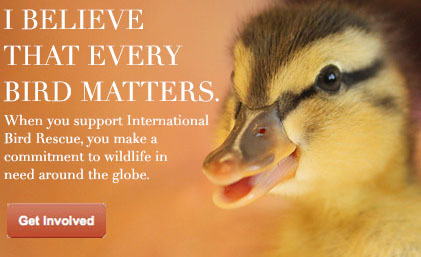 Check out @intbirdrescue for your “Every Bird Matters” fix! You’re invited to an egret and heron release in Santa Rosa! 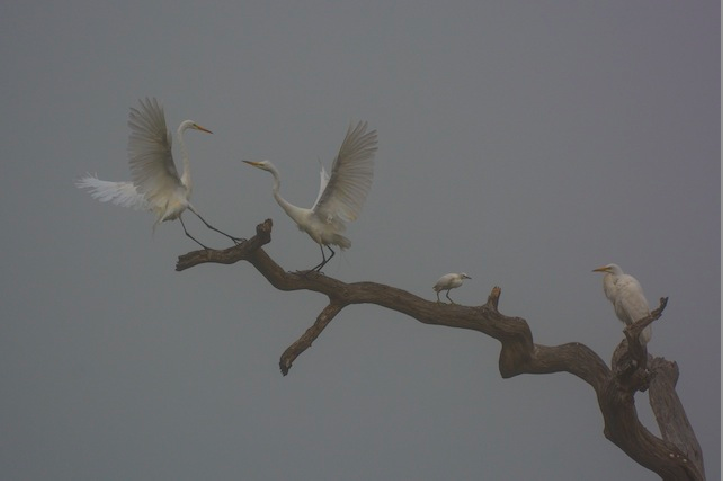 Love egrets? Love herons? Live in the Bay Area? If so, join us for a great release in Santa Rosa on Thursday morning! 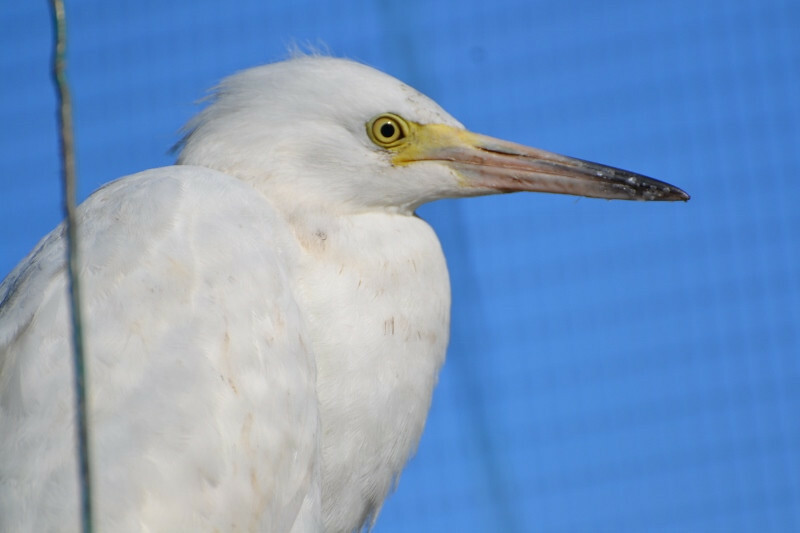 Here’s the deal: More than 20 young egrets and herons, many of which had fallen from their nests at Santa Rosa’s well-known Ninth Street colony, are set to be released together at nearby Laguna de Santa Rosa on Thursday, June 13 at 9am. The Santa Rosa colony, located on a median strip of eucalyptus trees, has been an unlikely nesting site for Snowy Egrets, Black-crowned Night Herons and other birds for the past 15 years. Yet every year, many baby birds fall from the nests and are rescued by volunteers from The Bird Rescue Center in Santa Rosa and other local organizations, lest they fall victim to traffic and other urban ills. The birds are then transported to International Bird Rescue’s San Francisco Bay wildlife care center in Fairfield, where they are raised and treated for any injuries. 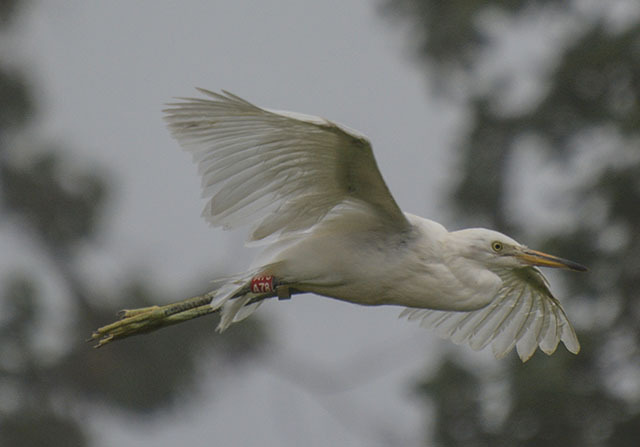 Upon release, the egrets are banded with red bands to better track them in the wild. 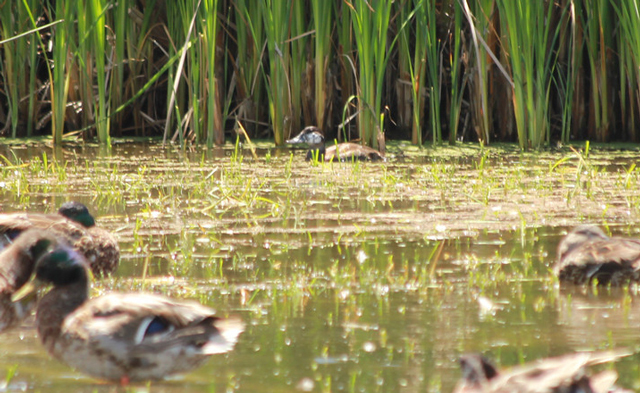 Several have been spotted at nesting sites in recent years. “It’s our responsibility to help care for the animals that have fallen from their nests, and to return to them to the wild,” said International Bird Rescue director Jay Holcomb. WHEN: Thursday, June 13, 8:30am call time for 9am release. Please arrive promptly at 8:30am, as release organizers cannot accommodate late-comers. WHERE: Meet in parking lot of Laguna de Santa Rosa Foundation Headquarters, 900 Sanford Rd, Santa Rosa, CA 95401 (see map below). From there, release organizers will lead attendees to a plowed pathway into the laguna grasslands and the release site to the west. 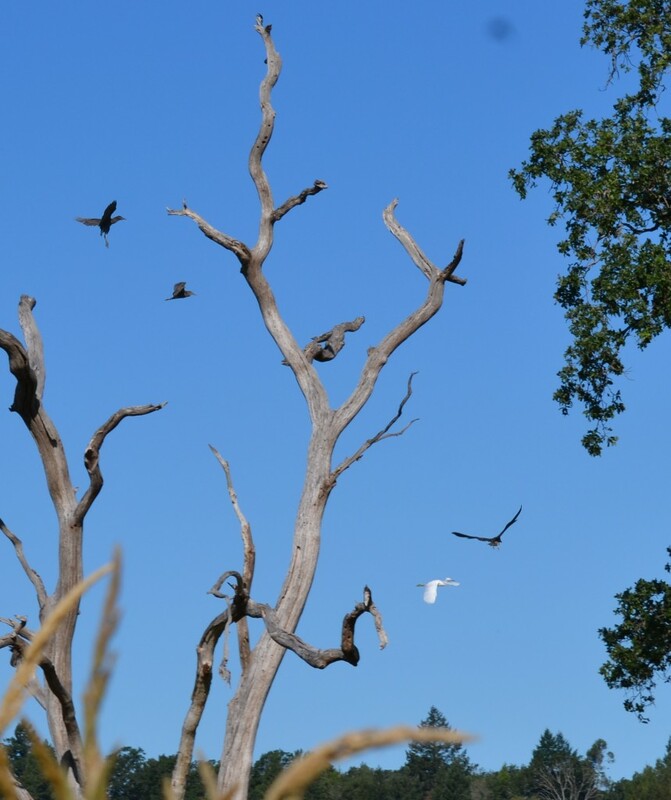 Special thanks to the Sonoma County Fish & Wildlife Commission for supporting these birds through a generous grant that helps cover the cost of their rehabilitative care. Sightings of our banded rehabilitated pelicans are always informative, bringing us new clues about their travels and survivability in the wild. 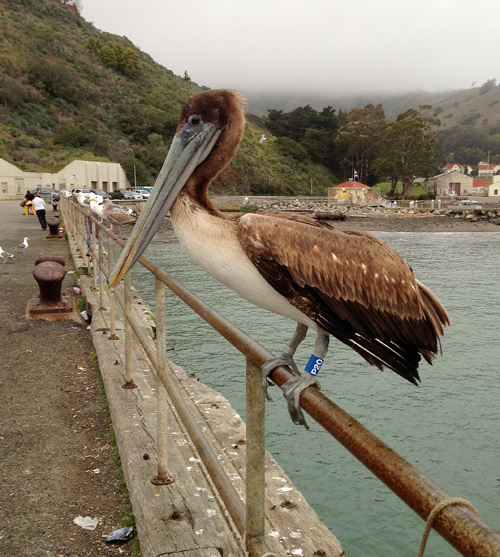 Here are a few recent stories from the pelican sighting files. 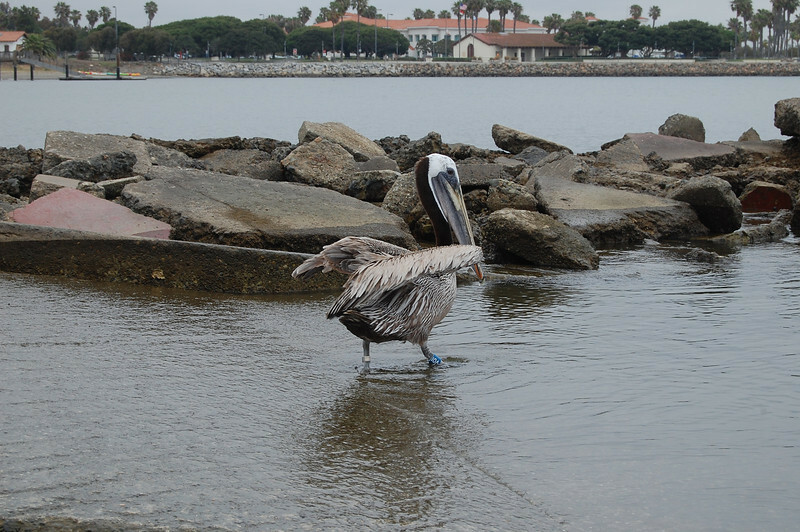 Why do pelicans become habituated to piers, fisherman and fishing areas? Brown Pelicans are predators, and young pelicans have to learn quickly how to catch their prey (fish) in order to survive. It’s trial-and-error at first, but while they are learning to hunt and care for themselves they create what is called a mental and behavioral “tool kit.” This tool kit consists of all the techniques and strategies they have discovered that produce fish. Watching the activities of fish-eating mammals such as dolphins and whales is a learned behavior. Following fishing boats back into port after a day’s catch, learning how to watch tides and observing where other fish-eating birds are foraging are all techniques learned that help localize a meal. Young pelicans are very impressionable during their first year because they don’t have a great fear of people. Have you ever watched fishermen casting their lines from a pier? You will see them reeling in lines with wiggling, sparkling fish. Pelicans and other birds are opportunistic and think that any wiggling fish coming out of the water is theirs for the taking. Piers loaded with fishermen hauling in multiple fish on multiple lines attract pelicans and become feeding grounds for pelicans who don’t know better. They learn quickly that people + piers = food. 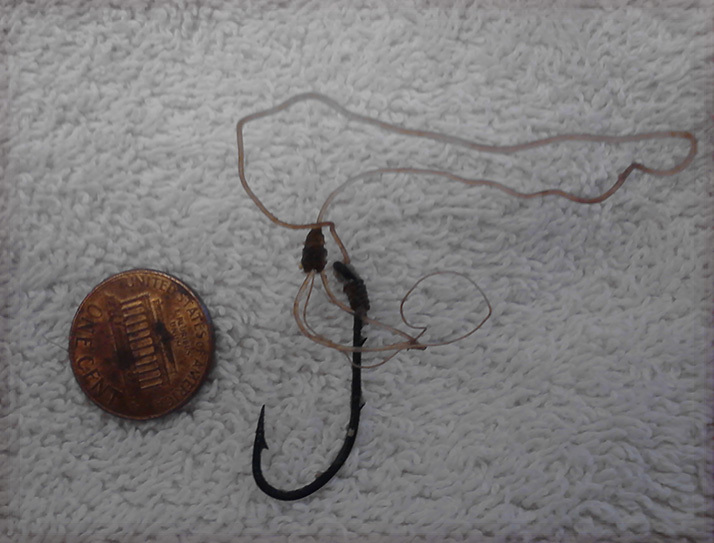 This becomes another usable tactic in their took kit, but it’s a dangerous one that can also lead to injuries from getting hooked or tangled in fishing line. M32 is demonstrating the similar exploratory nature of young birds. Like California Brown Pelicans R36 and R41 that migrated to Victoria, B. C. last fall, M32 is demonstrating the similar exploratory nature of young birds born into a viable population that sometimes move to the fringe of their range in search of food and good habitat. In some cases this works for them, but often these birds die or retreat to safer and more food-abundant areas within their range. R36 did not fly south when the weather turned very cold in Victoria when R41 and the other adult pelicans in the area left. R36 would have died in the cold had it not been rescued. M32 seems to have found a niche in the northern inland part of the San Francisco Bay, representing a young pelican on the fringe of its territory. 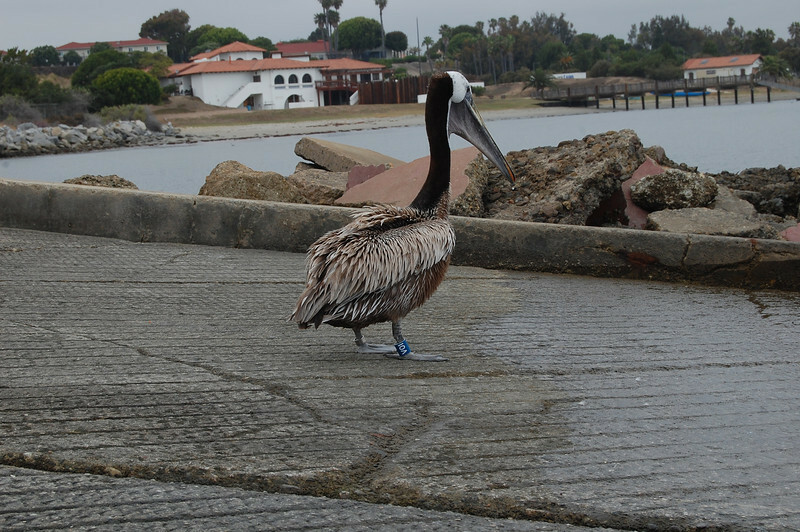 A friend of IBR and last year’s Blue-Banded Pelican Contest adult winner, Bernardo Alps, spotted pelican 0938-61101 hanging out at the dumpsters at the Ports O’ Call Marketplace in San Pedro, Calif. 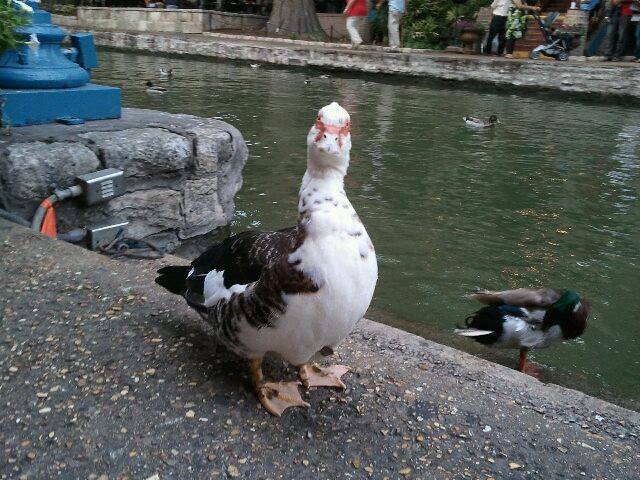 He noticed this bird was very dirty and not behaving normally. The pelican was captured and found to be covered with fish oil and oily waste from a fish-processing site. 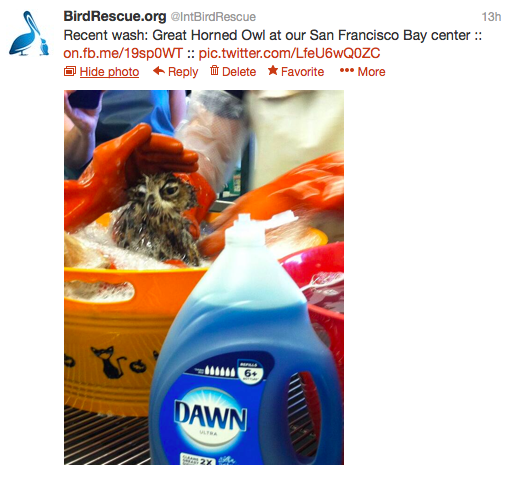 Once at our San Pedro center, it was washed to remove the oiling and now has an excellent chance of survival. 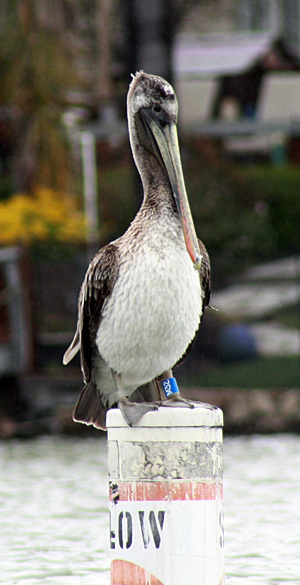 Fish oil contamination occurs when pelicans feed at commercial and public fish-processing sites. They can easily become covered in oily fish waste and water as they try to retrieve fish scraps. Dirty feathers from fish oil make the birds wet and cold just like any other oil does. When an oily pelican that is no longer waterproof attempts to plunge feed into the ocean for fish, it’s at risk of cold water reaching its skin, which can result in hypothermia. If an oiled pelican can still fly but is unable to feed in cold water, the bird may become a dumpster diver and beggar, as this is its only way to safely secure a meal and avoid becoming too cold. That’s what we assumed happened to pelican 0938-61101. It was staying alive by feeding in the Ports O’ Call dumpsters on fish scraps and other trash. 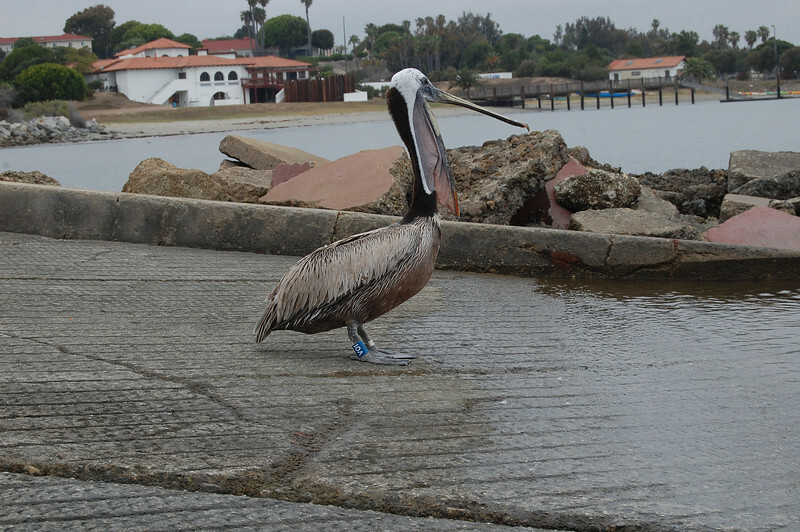 Pelican 0938-61101 was previously treated in our San Pedro center in November 2006 for injuries sustained from fishing line. 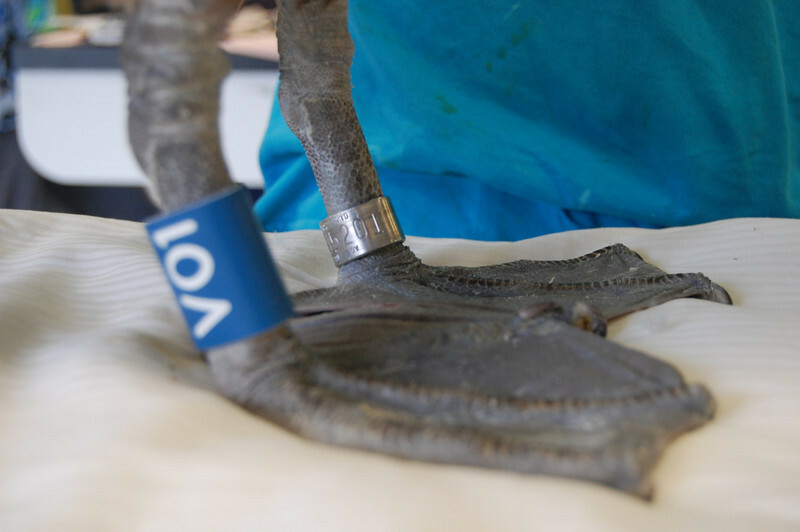 Seven years after her first release from care, this bird will soon be flying freely again sporting a new silver federal band and a highly visible blue plastic band on her leg to track her further travels. 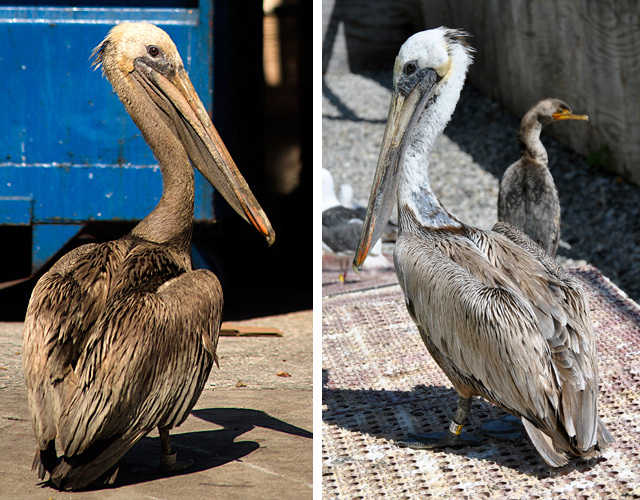 0938-61101: Dirty Brown Pelican coated in fish oil, left, and after cleaning, right, at our Los Angeles Center. 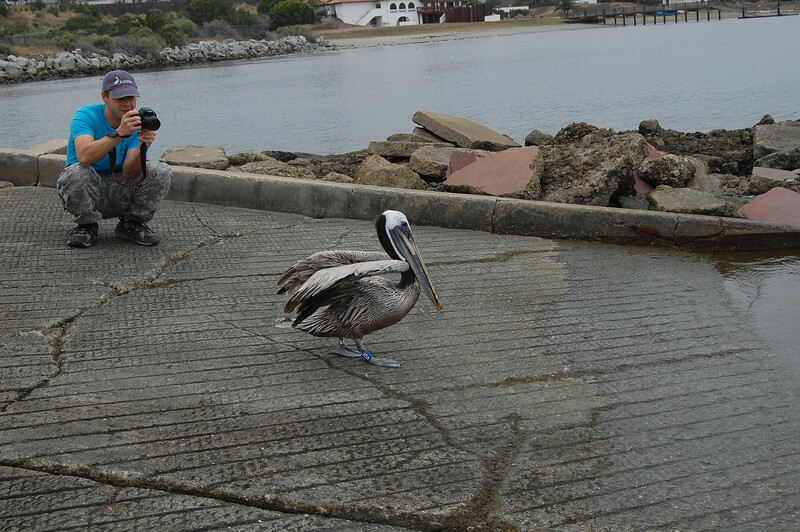 Upon successful rehabilitation, a previously fish-oiled Brown Pelican was released Wednesday in the San Pedro area. 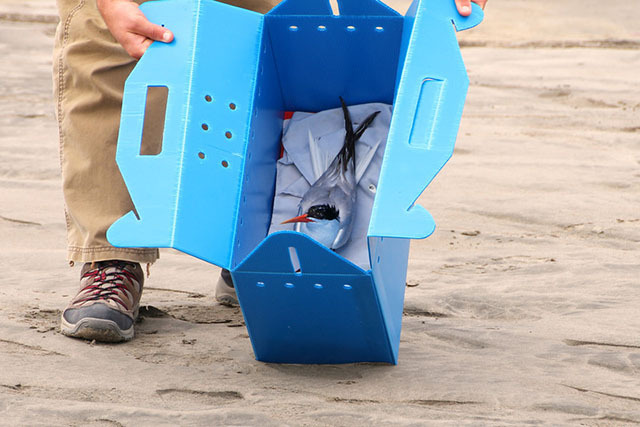 Photos of the bird and the release below at Cabrillo Beach by Julie Skoglund. 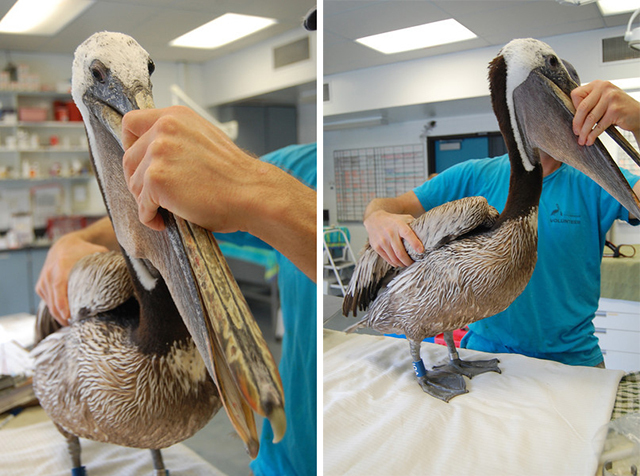 This pelican first came into our San Pedro center on 11/2/2006 as a first-year bird with fishing tackle injuries. Since its release, it has been reported two other times in San Pedro on 12/18/2008 and on 1/2/2013. Captured fish-oiled on 5/5/13, the bird was rehabilitated and released on 6/12/13. Its new band number is now V01.